After writing about the Seed Market in 2015, I wondered whether I could find some data to support Sam Altman’s observation that acquihires have fallen in frequency over the past year by 66-75%. The chart above shows an estimate of the acquihires in US technology companies over the past four years. There is no perfect data set on acquihires because many of these transactions are never announced. So this estimate, which I created using Crunchbase data, likely underestimates the total number of acquihires in every period. To calculate the data, I filtered all the startups who had been acquired for undisclosed amounts and raised less than $6.5M (the sum of the average seed round in 2014 and the median series A). Over the past four years, on average 15 companies are acquihired each quarter. 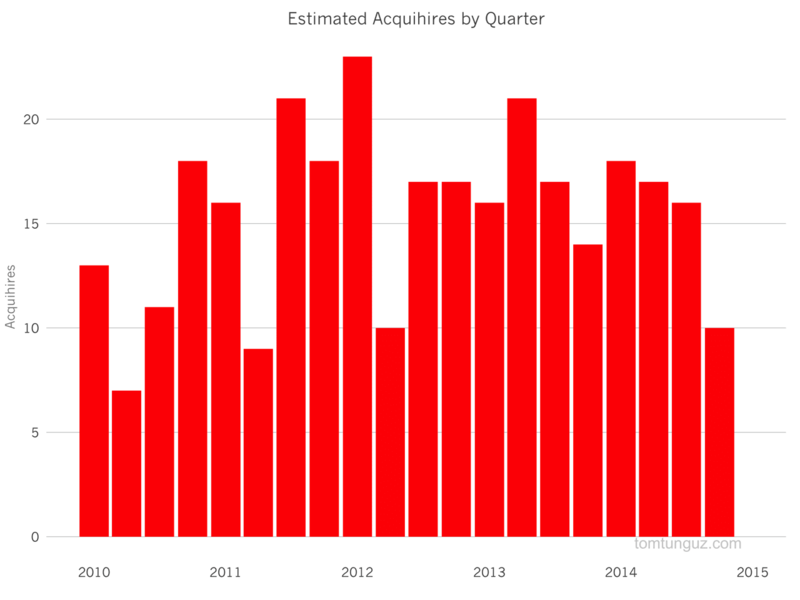 And on an annual basis, the cadence of acquihires is steady, in the high 60s. 2014 saw a modest drop to 61. As the chart above shows, the three first quarters of the year exceeded the average and Q4 recorded ten. This drop could be an actual decrease. Or it could be caused by a delay in the announcement of these acquisitions. Wrapping up the paperwork can take time. If the data does hold, then there would seem to be a decline in acquihires, but that decline isn’t unprecedented. Q2 2010, Q2 2011 and Q2 2012 all saw similar drops before the levels rebounded. In fact, Q2 is consistently the slowest quarter in each year, excluding 2014, possibly due to the impact of summer vacation. However, there is a consistent pattern elsewhere in the acquihire market. Startups are raising less and less before being acquired. 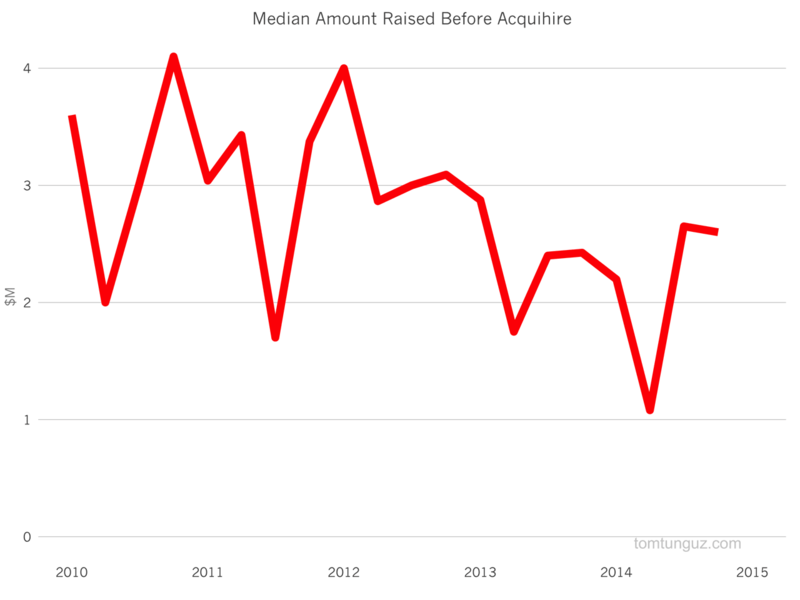 The line above charts the slow, but consistent decline in the median amount raised by the acquihired companies. In 2010, the median was in the $3-4M range. In 2014, that figure is in the $1-2M range. This may indicate a new strategy by the acquirers’ corporate development teams. Instead of acquiring companies after the Series A, as they did in 2010 and 2011, these corp dev groups are pursuing talented companies after the seed. Because there are fewer investor dollars in, these acquirers may be able to pay less for the same talent. Or perhaps, the acquihire market has grown more competitive and corp dev teams acquire earlier. Or perhaps, startups founders understand better when their idea or technology or team is better suited as part of a larger entity sooner. There is no great data set to analyze the acquihire market. But these estimates from Crunchbase indicate that the acquihire market slowed a very small amount in 2014, caused by a deceleration in Q4. The competition talent market shows no signs of slowing down, and competition fuels the acquihire market. Unless there’s a material change in talent or a set of new acquisition strategies employed by the big technology companies, I don’t expect much of a change in 2015.